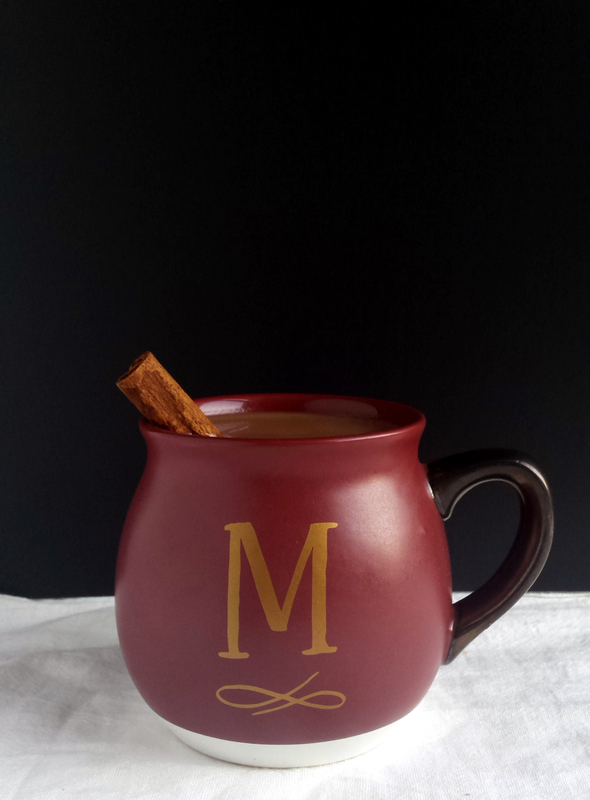 Treat yourself to a mug of Hot Spiced Coconut Apple Cider on a chilly fall evening. While I love simplicity in my meals, I can’t help but fancy up foods, too. It takes just a few brief moments to make additions that will enhance without complication. The resulting foods exemplify easy gourmet. For example, smearing plain ‘ol vegan mayo on my sandwiches is just plain boring. I’d rather add flavoring agents like this fabulous combo: minced garlic, fresh herbs, and smoked paprika. Yum! And, vegetable broth is great to flavor food with, but broth and mirepoix are better. No matter what I have in my fridge, I can upgrade my hummus with something amazing; a touch of hot sauce, pureed beets, minced garlic, or chopped olives puts a fun twist on a simple hummus and veggie sticks snack. One of my autumnal favorites is apple cider, preferably purchased straight from the farmer’s market stand. Unpasteurized, bold and earthy, slight-hint-of-ferment goodness. I’ll drink it any which way, but I love warming up a cup for a post-dinner treat. When I want an extra special treat for myself, or if I’m hosting guests, I’ll upgrade it. I love to simmer warming spices in the cider and top it off with a generous pour of full-fat coconut milk. Coconut, in its versatility, may evoke memories of sipping on the water straight from the nut as a beachside beverage or indulging in a rich bowl of creamy curry that takes the bite of winter away. Therefore, coconut milk is a lovely addition to celebrate the change of seasons. This Hot Spiced Coconut Apple Cider is a favorite of those who have tried it. It’s a sweet, comforting drink that will cap off a chilly fall night in the perfect way. In a large pot, bring the apple cider to a simmer. Add in the spices and ginger root. Stir. Simmer for 20 minutes. Add in the coconut milk and whisk to incorporate. Simmer on low for a few more minutes. Strain the cider to remove the ginger pieces, and then pour back into the pot. Ladel the apple cider into mugs, garnish with a cinnamon stick, and serve. *Tip: If you don’t serve immediately, make sure to give it a stir to distribute the spices before serving.